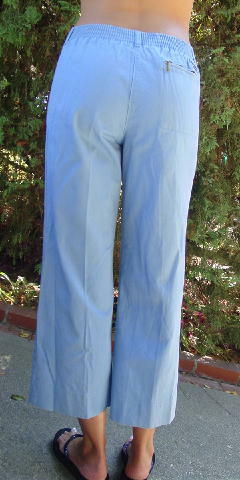 These light blue 100% cotton vintage (capri length) pants are by Givenchy and were made in Hong Kong. They have that "well-loved" look. The back of the waistband has 1 1/2" of elastic. The waistband is 1 3/8" wide in the front. There are belt loops and an antique brass logo button on the waistband and one logo snap on each little front pocket which is on the front of each large diagonal pocket. 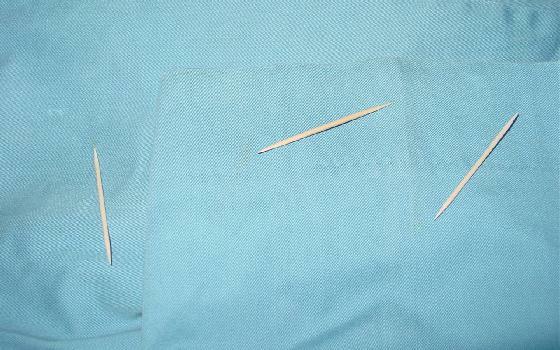 They also have a 5 3/4" long zipper fly. 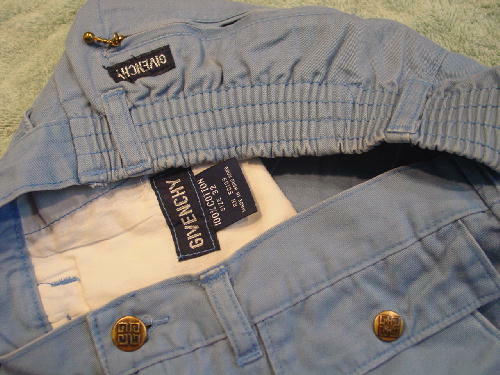 The back has a zipper pocket with a brass-tone pull and a Givenchy logo tag above it. 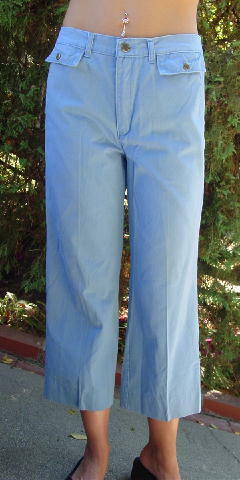 Some of the color on the top of the waistband as well as the tips of the pocket flaps has gotten lighter with age. The surface has some light pilling. The left bottom leg has a very pale (yellowish) age spot near the upper stitching of the pant hem and on the center crease and there is one on the left upper leg (11 1/4" down from the top) and a white tiny bracket-shaped mark 1" above that. The tag says size 32. The color on the third picture is not accurate. They're from a former New York model. waist to hem 34 3/4"